Answer: This question was actually asked by an advertising agency director (who shall remain anonymous) in reaction to the submission of the above image for use by one of their clients. The short answer is “yes,” but not for millions of years, or unless you move the camera a very long distance. You see, M31, also known as the Great Galaxy in Andromeda, is very far away. Although it is the closest galaxy to our own Milky Way galaxy, its extreme distance precludes the possibility of “getting a shot from a different angle.” We just can’t move around it for a different view, like a wedding photographer angling to get the best shot. At a distance of 2.3 million light years, you’d need to shift the camera 40,000 light years to change the viewing angle by 1°. But there is hope, of sorts. 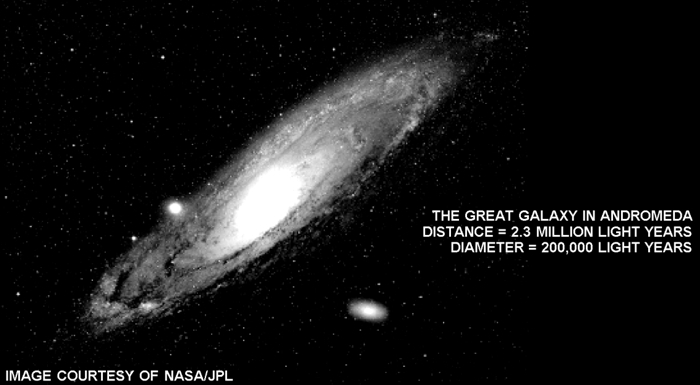 M31 is moving toward our own galaxy at a speed of about 100 miles/second. It will inevitably collide (or, more properly, “merge”) with our galaxy in some 3 billion years. As these two galaxies approach, gravity will distort their now disc-like shapes and alter their angles of tilt. Then the pictures will look vastly different. By the way … don’t sweat that “collision” thing. By then, we should have air bags installed on the Milky Way. Maybe I should talk to that ad agency about promoting the idea.